Dris gives a briefing on the significance and background of the memorial. 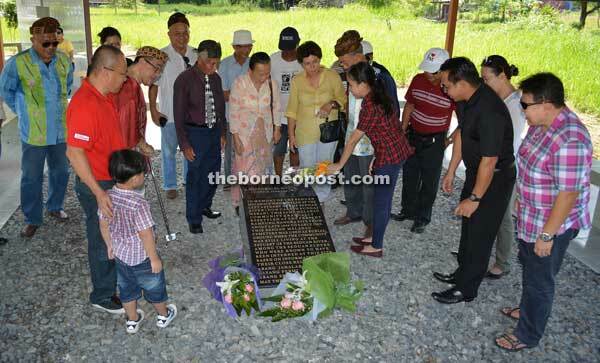 SIBU: The Seduan Melanau community held a traditional ceremony yesterday to mark the completion of a memorial that celebrates their historical heritage. 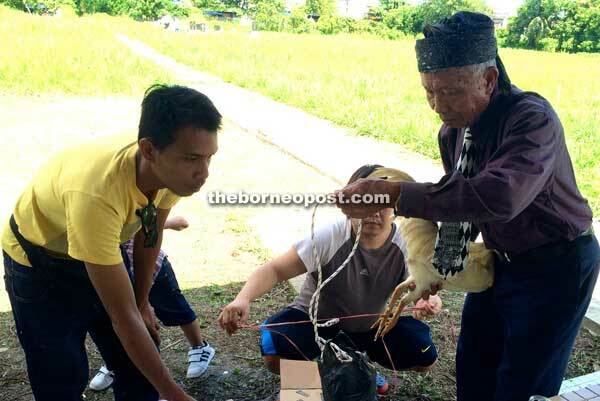 Some 50 multi-generational members of the community gathered at the Kampung Nangka Melanau Community Cemetery for the ceremony, which began with Christian prayers. This was followed by an explanation on the significance and necessity of the memorial by Datu Aloysius J Dris, who was the main proponent in building the memorial. “The main reason for us to have this event today is so that the younger generation in our community do not forget about our history and where we come from. “This initiative was not meant for the sake of glorification, but to share the story and history of the Seduan Melanau community, so that the next generation remembers and continues to share our community’s story and history,” he said. He explained how the Seduan Melanau could trace their historical roots here as far back as the 1700s. “For this current generation in the Seduan Melanau community, the volcanic eruption of Mount Krakatoa in 1883 has always been a reference point because when it occurred they had already settled in the Seduan River area, which today is referred to as Sungai Merah, for many generations. “In fact, in government records the Sungai Merah area is still referred to as Seduan,” he said, while pointing out that there is still debate on whether the Melanau community here was named after the river or whether the river got its name from the people. He pointed out that there was a wealth of research topics that the younger members of the community could pursue to document the Seduan Melanau’s historical heritage. “The Sarawak Museum, journals, writings of the Brooke and British colonial era officers could be starting points for your research in learning more about your community. “The Brunei Museum and government archives could also be a source of research material for the young people in the community who I hope will take up the challenge of documenting our heritage to fill in the gaps of our community’s history,” he added. Silvester Laijanai (right) prepares a cockerel for the symbolic cockfight with the help of younger members of the community. During the dialogue that followed, members of the community shared their own knowledge of the Seduan Melanau’s heritage based on the oral history passed down to them by their elders over the generations. As with tradition at very significant Seduan Melanau events in the past, a symbolic ceremonial cockfight was held near the memorial, adding to the celebratory spirit of the event. The memorial, constructed out of granite, is placed where a traditional burial shed known as a Bakut once stood, and where at least three graves are sited. Four ancient grave markers made of Belian (Borneo ironwood) still stand under a reconstructed Bakut, which serves the purpose of protecting the markers from the elements. The senior members of the community still remember seeing at least three Bakut built in the cemetery when they were younger. The wording on the memorial reads: “A Historical Memorial (circa 1700 – 1900 AD). In memory of the Seduan Melanaus, who settled at the left estuary of the Seduan River (now called Sungai Merah). “This same Melanau community gradually resettled at the present Kampung Nangka site from about the late 1800s to the early 1900s. “This Seduan Melanau Cemetery was used as a burial ground when the community was still living at the estuary of the Seduan River. Claudia Nalu Leo places a bouquet on the memorial.